This is a tea time snack, my mom used to make with Maida flour. Here is the recipe. 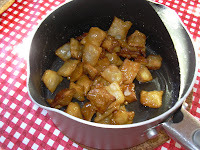 First take a pan, add sugar and 1/2 cup water and bring it into a fine syrup. 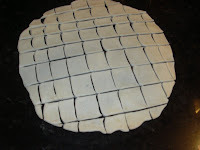 In the mean time, mix baking soda, oil and salt to the maida and add little amount of water and make it a fine dough. Spread it into 7" roti. Now with the help of a knife, cut the roti into whatever shape you like. 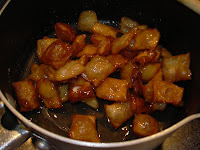 Pre heat oil and fry these roti pieces into golden brown and immediately put it into sugar syrup. Mix it well. Careful while you use spatula for mixing. This is a wonderful evening snack.